THE GRAND PRIZE WINNER FOR 2018 IS …Al Boyles of Amherst, Wisconsin! Al and his wife Bobi are the proud winners of the National Motorcycle Museum’s 2018 Indian Fundraiser Motorcycle! 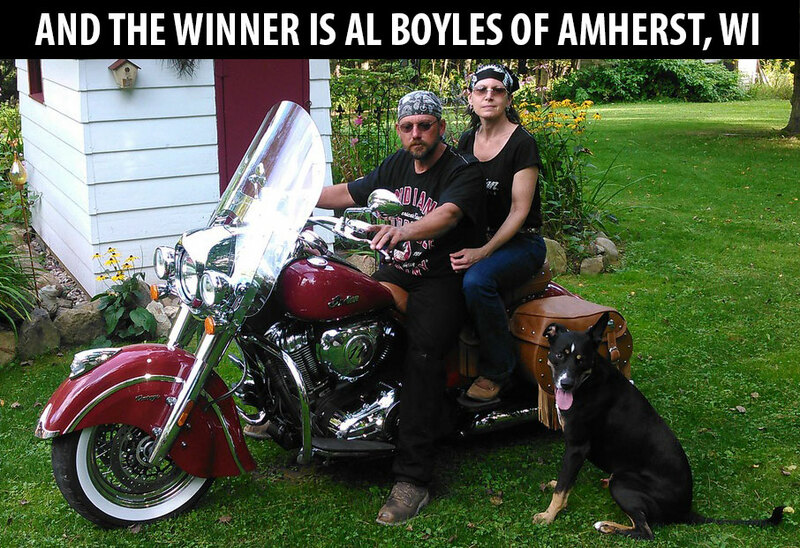 2018 Fundraiser Bike winner Al Boyles was certainly surprised to have won the Indian Chief Classic, but he’s no stranger to Indian motorcycles. His comment to Bill Barber, who called New Years Eve with the good news: “I have a 2016 Chief Vintage with 24,000 miles and also a 2017 Chief Roadmaster Classic with 21,000 miles, and my son has a Scout.” But maybe this new Chief will help Al get over to Ireland and ride there with his wife Bobi and an old friend who also has a late model Chief. Al is a superintendent for a commercial construction company, lives in Amherst, Wisconsin. He rode dirt bikes when young, had a Honda Shadow for awhile then took a break from riding, came back, got interested in new Indians. Al bought six tickets last April on a ride to Museum, but Bobi, who also rides, received 12 tickets in our mailing and sent those back with her donation. Al’s were the lucky ones. Al and Bobi live close enough to drive down to Anamosa to pick up their new Indian and get paperwork done at their local shop, Tytler’s Cycle in De Pere, Wisconsin. Congratulations, Al and Bobi. There were also two winners of Indian Scout Helmets. Terry Farnsworth’s ticket was the second one pulled, but we had to mail him notification as the phone number he supplied was no longer working, and we had no email address for him. Terry lives in Staunton, Illinois. Give us a ring, Terry, and claim your prize! Walter Chodykin’s ticket was the third one pulled so he wins an Indian Scout helmet as well. Walter had a tank shift 50’s Harley-Davidson FL, but his newer bike is an ’88 Harley-Davidson Soft Tail. He received 12 tickets in the mail, sent them back with his donation and one of them was a lucky ticket. Walter supports the Museum annually though he has not yet visited, now plans to. The drawing was conducted on New Years Eve, January 31, 2018 about 2:00pm. Tickets were pulled from the hopper by local bank CPA’s, Jeff Stout and Traci Worcester. The 2019 Fundraiser Bike is an brand new Indian FTR1200S. Donate for your chances to win soon as you could be as lucky as Al and Bobi Boyles!